Glycopyrronium tosylate (GT) is a topical anticholinergic approved in the USA for primary axillary hyperhidrosis in patients aged ≥ 9 years. GT was evaluated for primary axillary hyperhidrosis in replicate, randomized, double-blind, vehicle-controlled, phase III trials. GT reduced sweating severity and production versus vehicle and was generally well tolerated. Our objective was to evaluate patient-reported outcomes (PROs) from these trials. Patients aged ≥ 9 years with primary axillary hyperhidrosis ≥ 6 months, gravimetrically measured sweat production ≥ 50 mg/5 min in each axilla, Axillary Sweating Daily Diary (ASDD) Item 2 severity score ≥ 4, and Hyperhidrosis Disease Severity Scale (HDSS) score ≥ 3 were randomized 2:1 to GT 3.75% or vehicle applied once daily to each axilla for 4 weeks. The 4-item ASDD, 6 Weekly Impact (WI) items, Patient Global Impression of Change (PGIC), HDSS, and Dermatology Life Quality Index (DLQI) were utilized. In the pooled population, 463 patients were randomized to GT and 234 to vehicle; 426 (92.0%) and 225 (96.2%) completed the trials. At baseline, most patients considered their axillary sweating to be at least moderate in severity, impact, and bothersomeness (ASDD items 2, 3, and 4, respectively). Improvement was substantially greater for GT than for vehicle at every study week, and, at week 4, ASDD scores improved from baseline by 62.6 versus 34.0% (severity), 65.5 versus 40.3% (impact), and 65.4 versus 39.0% (bothersomeness). Improvements favoring GT versus vehicle also occurred for WI items, PGIC, HDSS, and DLQI. PRO results demonstrated that GT reduced the disease burden of primary axillary hyperhidrosis. Clinicaltrials.gov; ATMOS-1 (NCT02530281), ATMOS-2 (NCT02530294). The online version of this article ( https://doi.org/10.1007/s40257-018-0395-0) contains supplementary material, which is available to authorized users. Two large randomized controlled trials of glycopyrronium tosylate (GT), a topical anticholinergic, were conducted in adults and children (aged ≥ 9 years) with primary axillary hyperhidrosis. This report presents a detailed evaluation of these trials’ patient-reported outcomes (PROs), which are an important component of therapeutic impact assessment, along with objective measures of sweat production. In these trials, greater improvements were observed in GT-treated patients than in vehicle-treated patients across all PRO measures. Previously reported data showed significantly greater reduction in sweat production and sweating severity with GT versus vehicle, along with good tolerability, and the present results indicate that GT provides clinically meaningful benefits. Given these results, GT was approved by the US FDA (29 June 2018) for primary axillary hyperhidrosis in patients aged ≥ 9 years. Hyperhidrosis is a condition characterized by sweat production exceeding that which is necessary to maintain thermal homeostasis. Hyperhidrosis affects ~ 15.3 million people in the USA (prevalence of 4.8%) [1, 2] and adversely impacts quality of life to an extent comparable to, or greater than, the impact of psoriasis or eczema [2, 3, 4, 5, 6, 7]. Approximately half of those with hyperhidrosis experience excessive underarm sweating (i.e., axillary hyperhidrosis), the most commonly affected area . Treatments for hyperhidrosis have included over-the-counter and prescription antiperspirants, oral anticholinergic drugs, onabotulinumtoxinA, iontophoresis (application of mild electrical current through water), and ablation or removal of the sweat glands [8, 9]. These treatments differ in efficacy, safety, ease of use, and cost, and the more invasive procedures carry a risk of serious and/or irreversible side effects . Reports that hyperhidrosis may be underdiagnosed, that patients often delay or avoid seeking treatment, and that patients are dissatisfied with currently available treatments indicate that greater awareness of hyperhidrosis as a medical condition and new treatment options are needed [1, 6, 10, 11]. Objective measures of sweat production, including gravimetric measurements at discrete time points, can be highly variable due to temperature, humidity, and the sometimes-episodic nature of sweating, which can vary with time of day, emotional state, and daily activities . Patient-reported outcomes (PROs), which capture a patient’s treatment experience, should accompany objective measures of sweat production to adequately assess therapeutic impact. None of the existing PROs used to assess hyperhidrosis severity, including the Dermatology Life Quality Index (DLQI), Hyperhidrosis Disease Severity Scale (HDSS), and Patient Global Impression of Change (PGIC), meet current US regulatory standards to support product approvals and labeling. In particular, the DLQI and the PGIC, albeit widely used in dermatology clinical trials [13, 14], are not specific for hyperhidrosis. Furthermore, while the HDSS is a disease-specific instrument with acceptable validity, reliability, and responsiveness , its development did not include patient input, which is now a recommended component of instrument development . In addition, the HDSS combines two distinct concepts—tolerability and interference in daily activities—into the same item, limiting the interpretation of study results. The Axillary Sweating Daily Diary (ASDD) was developed in consultation with the US FDA and in consideration of FDA PRO guidance to assess severity, impact, and bothersomeness of axillary hyperhidrosis [17, 18]. Evidence supporting the validity of the ASDD has been reported, along with a description of other PRO measures, which are collectively referred to as the Axillary Hyperhidrosis Patient Measures (AHPM) [17, 18]. The AHPM includes the 4-item Axillary Sweating Daily Diary (ASDD; patients aged ≥ 16 years; ASDD-C: child-specific 2-item version, patients aged ≥ 9 to < 16 years), six Weekly Impact (WI) items (patients aged ≥ 16 years), and a single-item PGIC (patients aged ≥ 16 years) (Table 1). Notably, ASDD/ASDD-C Item 2 is a numeric rating scale (0–10) for assessing axillary sweating severity and has demonstrated validity, reliability, and responsiveness to axillary hyperhidrosis treatment effect in clinical trials [17, 18]. ASDD/ASDD-C Item 2 combined with the other components of the AHPM provide a comprehensive assessment of treatment efficacy and patients’ experience in axillary hyperhidrosis clinical trials. Glycopyrronium tosylate (GT; formerly DRM04) is a topical anticholinergic approved by the FDA (29 June 2018) for primary axillary hyperhidrosis in patients aged ≥ 9 years. GT is applied once daily to the axillae using a pre-moistened towelette (QBREXZA™ [glycopyrronium] cloth) . GT reduced sweating severity and sweat production (assessed by gravimetric measurement under controlled temperature and humidity) compared with a vehicle in two phase III, randomized, double-blind, controlled studies in subjects with primary axillary hyperhidrosis (ATMOS-1 [NCT02530281; EudraCT Number: 2015-002052-27] and ATMOS-2 [NCT02530294; EudraCT Number: 2015-002053-35]). Primary endpoints and safety data for these trials have been previously reported [20, 21]. GT was well tolerated in trials, and most adverse events were mild or moderate and infrequently led to discontinuation. The most common adverse events were dry mouth (24.2% GT vs. 5.6% vehicle), application site pain (8.7% GT vs. 9.5% vehicle), and mydriasis (6.8% GT vs. 0% vehicle). The onset of common treatment-emergent adverse events (TEAEs) occurred mainly in the first treatment week and decreased thereafter [20, 21]. Here, we report the PRO dataset from these trials, including the ASDD, which was used as a clinical trial PRO in full for the first time in these phase III trials. ATMOS-1 and ATMOS-2 were phase III randomized, double-blind, vehicle-controlled, parallel-group 4-week trials of GT 3.75% (equivalent to 2.4% glycopyrronium) (Fig. 1 in the Electronic Supplementary Material [ESM]). ATMOS-1 was conducted in the USA and Germany; ATMOS-2 was conducted in the USA. A full description of trial methodology is available [20, 21]. Patients were assessed at the clinic at weeks 1, 2, 3, and 4 (end of treatment [ET]). Patients were male or non-pregnant females aged ≥ 9 years (≥ 18 years in Germany) with primary axillary hyperhidrosis for ≥ 6 months, gravimetrically measured sweat production of ≥ 50 mg/5 min in each axilla, ASDD sweating severity (Item 2) score ≥ 4 (11-point scale) [17, 18], and HDSS grade 3 or 4 (4-point scale) . Patients were excluded for history of a condition that could cause secondary hyperhidrosis or that could be exacerbated by trial medication, prior surgical procedure for hyperhidrosis or prior axillary treatment with an anti-hyperhidrosis medical device, prior treatment with botulin toxin within 1 year of baseline or use of other treatments with anticholinergic activity. Three separate PRO assessments are collectively referred to as the AHPM: The ASDD, six WI items, and a single-item PGIC (Table 1) [17, 18]. ASDD/ASDD-C Item 1 assesses the presence of underarm sweating and is a ‘gatekeeper’ question for Item 2. ASDD/ASDD-C Item 2 assesses sweating severity [17, 18], and responders on ASDD/ASDD-C Item 2 are defined as those with a ≥ 4-point improvement from baseline, which corresponds to a PGIC rating of “moderately better” . ASDD Items 3 and 4 assess the impact on daily activities and bothersomeness of axillary sweating, respectively. ASDD items were completed daily and required at least 4 days of data per week to calculate weekly averages. Patient responses to ASDD Items 2, 3, and 4 were collected at baseline and averaged for weeks 1, 2, 3, and 4. The six WI items assess the disruption in the individual’s daily life caused by axillary hyperhidrosis. Patients aged ≥ 16 years completed WI items at baseline and at each subsequent study week (i.e., weeks 1, 2, 3, and 4). The PGIC was designed to assess overall change in axillary hyperhidrosis severity at the ET and was collected only at week 4/ET. These assessments were completed by patients using an electronic tablet. Patients completed the HDSS, a qualitative measure of the severity of the patient’s sweating based on how it affects daily activities , at baseline and weeks 1, 2, 3, and 4. A 2-point improvement in HDSS score has been associated with an 80% reduction in sweat production . The DLQI (score of 0–30)  and the children’s version of the DLQI (CDLQI; score of 0–30) were completed at baseline and week 4 (0–1 = no effect on patient’s life; 2–5 = small effect; 6–10 = moderate effect; 11–20 = very large effect; and 21–30 = extremely large effect ). The minimal clinically important difference (MCID) is the score difference that is the minimum considered clinically meaningful for a patient. Estimates of the DLQI MCID vary in different dermatological conditions. In inflammatory skin diseases, a DLQI score change of 4 has been estimated as the MCID, whereas in axillary hyperhidrosis, a DLQI score change of between 2.8 and 4.6 has been estimated as the MCID [14, 23]. All analyses were conducted on the intent-to-treat (ITT) population (all patients who were randomized and dispensed trial drug or vehicle). Change from baseline (CfB) to week 4 for the ASDD/ASDD-C Item 2 responder rate (≥ 4-point improvement) was part of the primary efficacy evaluation for both studies and was analyzed using a Cochran-Mantel-Haenszel (CMH) test stratified by analysis center. For ASDD items 3 and 4, mean score CfB was summarized using descriptive statistics according to the statistical analysis plan for the studies. To provide a more easily interpreted format, mean percent CfB in ASDD/ASDD-C Item 2, ASDD Item 3, and ASDD Item 4 was calculated and is presented here. Prespecified analysis of HDSS responder rate (% of patients with a ≥ 2-grade improvement from baseline) was performed using a CMH test stratified by analysis center at week 4. Prespecified analysis of CfB to week 4 in DLQI/CDLQI was performed using an analysis of covariance (ANCOVA) model with factors of treatment group and analysis center with baseline score as a covariate. For PGIC, treatment groups were compared using an ANCOVA with factors of treatment group and analysis center (post hoc). Missing values were imputed for ASDD/ASDD-C Item 2 and HDSS responder rate (Markov chain Monte Carlo) along with WI impacts (last observation carried forward); missing values were not imputed for other PRO assessments. Analyses were conducted for ATMOS-1 (prespecified), ATMOS-2 (prespecified), and pooled ATMOS-1 and ATMOS-2 (post hoc). A total of 344 patients in ATMOS-1 and 353 patients in ATMOS-2 were randomized, and at least 90% completed week 4 in each treatment arm in both trials [20, 21]. Patient demographics (reported in full previously) [20, 21] and baseline disease characteristics were generally similar across treatment arms and trials (Table 2). Prior to participation in the ATMOS-1 and ATMOS-2 trials, patients had symptoms of axillary hyperhidrosis for an average of 15.5 ± standard deviation (SD) 10.8 years and an average sweat production of approximately 174.2 ± SD 199.8 mg/5 min. To evaluate the hyperhidrosis burden experienced by patients entering the ATMOS-1 and ATMOS-2 trials, the proportion of patients with different threshold score cutoffs at baseline was determined for ASDD/ASDD-C Item 2 and ASDD Items 3 and 4. Most patients at baseline considered their axillary sweating to be of at least moderate severity, impact, and bothersomeness according to their reporting on the ASDD/ASDD-C Item 2 and ASDD Items 3 and 4, respectively (Table 2 and Fig. 2a–c in the ESM). At baseline, more than half of all patients reported that their sweating severity was at least a 7 (moderate severity) on the 11-point ASDD/ASDD-C Item 2 scale, where 0 represents no sweating and 10 represents worst possible sweating (Table 2 and Fig. 2a in the ESM). Approximately one in five patients reported experiencing severe axillary sweating (ASDD/ASDD-C Item 2 score ≥ 9). For ASDD items 3 and 4, which were completed by patients aged ≥ 16 years, at least one in three reported feeling severely impacted and/or bothered by their sweating (Table 2 and Fig. 2b–c in the ESM). As assessed by WI items (completed by patients aged ≥ 16 years) at baseline, most patients answered ‘yes’ to questions asking whether their underarm sweating affected their actions or emotions during the past week (Table 2 and Fig. 1). Notably, most patients avoided interactions with other people or took additional measures to manage their excessive sweating (i.e., showering/bathing more than once a day; changing shirts during the day), and, overall, > 96% of patients reported feeling embarrassed about their axillary sweating. For trial entry, patients were required to have an HDSS score of 3 (sweating is barely tolerable and frequently interferes with daily activities) or 4 (sweating is intolerable and always interferes with daily activities) . In ATMOS-1, a larger proportion of GT-treated patients had HDSS grade 4 than did vehicle-treated patients, whereas patients with HDSS grades 3 and 4 were more uniformly distributed across treatment arms in ATMOS-2 (Table 2) [20, 21]. Baseline scores for each treatment group in each trial ranged from 10.1 to 12.1 for the DLQI and 6.9 to 10.6 for the CDLQI (Table 2 and Fig. 4). For the DLQI, these baseline scores indicate a moderate to very large effect of hyperhidrosis on the patients’ lives, according to validated descriptors of the DLQI . As previously reported, the ASDD/ASDD-C Item 2 responder rate (coprimary outcome; ≥ 4-point improvement) at week 4 was significantly greater for GT-treated patients than for vehicle-treated patients in ATMOS-1 (53 vs. 28%) and ATMOS-2 (66 vs. 27%) (p < 0.001 each study) and in the pooled population (59.5 vs. 27.6%; p < 0.001) [20, 21]. Improvement in axillary sweating severity was greater for GT-treated patients than for vehicle-treated patients at every study week (Table 3 and Fig. 2a). In the pooled population, scores improved by 62.6% (GT) versus 34.0% (vehicle) by week 4 (Fig. 2a). Improvement in scores related to the impact (ASDD Item 3) and bothersomeness (ASDD Item 4) of axillary sweating on daily activities was greater for GT-treated patients than for vehicle-treated patients at every study week (Table 3 and Fig. 2b, c). In the pooled population at week 4, ASDD Item 3 scores improved by 65.5% (GT) versus 40.3% (vehicle) (Fig. 2b) and ASDD Item 4 scores improved by 65.4% (GT) versus 39.0% (vehicle) (Fig. 2c). For the WI items, the proportion of patients whose lives were adversely impacted by sweating decreased at week 4 for all patients across trials and regardless of treatment; however, a greater proportion of patients receiving GT versus vehicle improved in all WI items across trials (Table 3 and Fig. 1). These results indicate greater improvement and less disruption in daily life due to hyperhidrosis with GT treatment. Pooled PGIC results at week 4 showed that 77.1% of GT-treated patients rated underarm sweating as much better or moderately better, compared with 39.4% of vehicle-treated patients (Fig. 3). At week 4 in each trial and the pooled analysis, the proportion of patients with ≥ 2-point improvement in HDSS from baseline was significantly higher in the GT group (59.1%, pooled analysis) than in the vehicle group (25.7%; p < 0.001), and a difference was seen as early as week 1 [20, 21]. 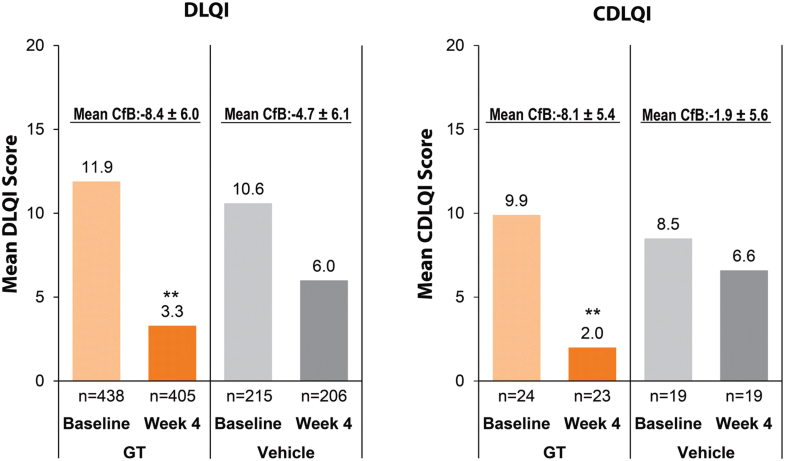 At week 4 in each trial, GT groups had a significantly greater mean decrease (improvement) from baseline in DLQI than those in vehicle groups (p < 0.001 for both trials), and the pattern was similar in the pooled analysis (Table 3 and Fig. 4). Similar trends were observed for the CDLQI, though the sample size was much smaller and statistical difference between treatment groups was not achieved in ATMOS-1 (Table 3 and Fig. 4). The ASDD, a 4-item PRO that assesses the severity, impact, and bothersomeness of axillary hyperhidrosis , was utilized in phase III trials for the first time in the ATMOS-1 and ATMOS-2 trials of the topical anticholinergic, GT. The ASDD, along with WI items and PGIC, provide a comprehensive approach to assessing treatment effect for axillary hyperhidrosis from the patient’s perspective, and the use of these PROs and others, combined with objective measures of sweat production reported previously [20, 21], resulted in a thorough evaluation of GT efficacy for primary axillary hyperhidrosis. Given the inclusion/exclusion criteria of these trials, particularly the requirement for an HDSS score of 3 (sweating is barely tolerable and frequently interferes with daily activities) or 4 (sweating is intolerable and always interferes with daily activities) , there was an expectation of high disease burden at baseline. The evaluation of additional baseline PRO scores confirmed that the burden of axillary hyperhidrosis was substantial for patients entering these trials, with most experiencing moderate or severe axillary sweating (ASDD/ASDDC Item 2 score ≥ 7) and moderate or severe negative impacts on daily activities (ASDD Item 3 score ≥ 2 and WI items), state of mind (ASDD Item 4 score ≥ 2 and WI items), and quality of life (DLQI score >10). Although roughly 20% of patients considered their axillary sweating to be severe (per ASDD Item 2), an even greater proportion of patients felt severely impacted (about 30%; Item 3) and severely bothered (about 40%; Item 4) by their sweating, showing that even those with “moderate” sweating severity still report “severe” levels of impact and bother. These findings underscore the significant daily burden associated with axillary hyperhidrosis and are consistent with previous reports describing the negative impacts of axillary hyperhidrosis on personal relationships, emotional health, and occupation [1, 2, 3, 6, 7, 11]. After 4 weeks of treatment in these trials, GT resulted in substantially greater improvements compared with vehicle for all PRO measures of the AHPM (ASDD items, WI items, and PGIC). Patients achieved a notable response with GT compared with vehicle by week 1 (assessed by ASDD items), and the bulk of the overall response as measured by the ASDD appeared to be achieved within the first 2 weeks. From a clinical perspective, treatment with a fast onset of effect is highly relevant to patients and an important consideration when making treatment decisions. WI items were developed to understand treatment impact on daily life with greater granularity. Across all WI items, GT treatment over 4 weeks was associated with notably larger decreases in the proportion of patients impacted by these items compared with vehicle, with decreases of at least twofold for GT-treated patients. These results suggest a broad reduction of the impact of axillary hyperhidrosis on daily life, which is consistent with the results observed for ASDD Item 3, which assesses the overall extent to which axillary sweating impacts the patient’s activities. Greater improvements with GT compared with vehicle were also observed for the DLQI and CDLQI. 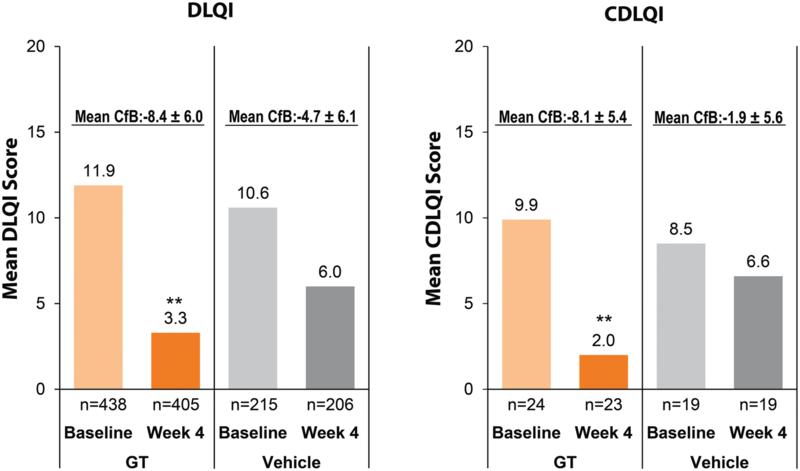 The magnitude of the DLQI score improvement from baseline to week 4 was approximately 8 points for GT-treated patients, which exceeds the previously described DLQI score change considered to be clinically relevant (MCIDs of 2.8–4.6) [14, 23]. Vehicle-treated patients also improved but to a lesser extent (4–5 points). Similar trends were observed for the CDLQI, though the sample size and between-group differences were smaller. 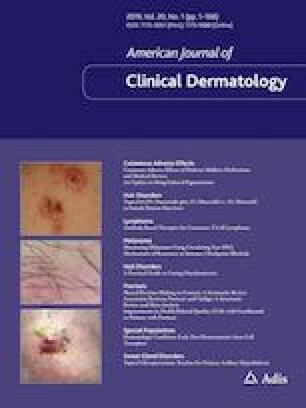 The consistent results across different measures of the AHPM, which assess various domains of disease burden, as well as on the DLQI/CDLQI and, as previously reported, the HDSS [20, 21], suggest that GT has the potential to reduce the burden of disease for patients with axillary hyperhidrosis. Based on the data from these phase III double-blind trials, the FDA approved GT (June 2018) for the treatment of primary axillary hyperhidrosis in patients aged ≥ 9 years . A limitation of these results is that the trials were relatively short (4-week duration) compared with the chronicity of the condition, though it should be noted that preliminary results from the long-term open-label extension of these trials have been reported and are consistent with the results provided here for the double-blind trials . In addition, a somewhat higher percentage of patients were randomized to GT versus vehicle who had baseline scores of ≥ 2 or ≥ 3 for ASDD items 3 and 4, though the underlying reason for and impact of these results is unclear. Further, although some pediatric patients were included in these trials, most participants were adults, and patients aged < 16 years did not complete ASDD Items 3 and 4, WI items, or the PGIC. Though further study in younger patients will be useful, it should be noted that a post hoc analysis of the pediatric patient population from these trials showed an advantage with GT across multiple efficacy measures . Finally, the effect of vehicle in these trials has been observed in other dermatology trials (e.g., acne studies [26, 27]) and indicates the importance of using a matching vehicle comparator in hyperhidrosis trials as well as inclusion of appropriate excipients for GT. The GT towelette contains the following excipients: citric acid, dehydrated alcohol, purified water, and sodium citrate . Identical excipients were included in the vehicle comparator of the ATMOS trials to account for any potential effect due to a compound other than GT. Despite the vehicle effect in these trials, GT-treated patients had a significantly greater response than that observed with vehicle [19, 21]. The newly developed ASDD provides a comprehensive patient-focused assessment of the burden of axillary hyperhidrosis, and the profile of patients entering the ATMOS-1 and ATMOS-2 trials underscores the need for effective therapies. Improvements in GT-treated patients across multiple PRO measures in the 4-week ATMOS-1 and ATMOS-2 phase III, vehicle-controlled trials, combined with previously reported data for the coprimary endpoints of these studies that demonstrate reduced sweat production (assessed by gravimetric measurement) and improvements in sweating severity as well as good tolerability, support the use of GT to provide clinically meaningful benefits for patients with primary axillary hyperhidrosis. Topical, once-daily application of GT is a noninvasive and well-tolerated treatment option approved for primary axillary hyperhidrosis in patients aged ≥ 9 years, and we anticipate its use alongside topical antiperspirants as first-line therapy for primary axillary hyperhidrosis. Future studies should consider evaluating the effectiveness of GT in combination with other approved therapies such as botulinum toxin injections and microwave thermolysis. Medical writing support for this manuscript was provided by Merrilee R. Johnstone, Ph.D., of Prescott Medical Communications Group (Chicago, IL). ATMOS-1 was conducted in the USA and Germany; ATMOS-2 was conducted in the USA. Trial protocols and informed consent forms were approved by local institutional review boards or independent ethics committees on 13 May 2015, and the first patients were enrolled in July 2015 (ATMOS-1) and August 2015 (ATMOS-2). The trials were registered on ClinicalTrials.gov on 21 August 2015 (ATMOS-1 [NCT02530281] and ATMOS-2 [NCT02530294]). Both trials were carried out in accordance with Good Clinical Practice and the Declaration of Helsinki. These studies were sponsored and funded by Dermira, Inc. All costs associated with the development of this manuscript were funded by Dermira, Inc.
DMP has received honoraria for consultancy from Brickell Biotech, Inc., Biofrontera AG, Celgene, Dermira, Inc., DUSA Pharmaceuticals, Inc., LEO Pharma, Novartis, Promius Pharma, LLC, Regeneron Pharmaceuticals, Inc., Sanofi, TheraVida, Inc., and Valeant Pharmaceuticals International, Inc; honoraria for participating on an advisory board for Pfizer, Inc.; investigator grants/research funding from Abbott Laboratories; Amgen, Inc.; Brickell Biotech, Inc.; Celgene; Dermavant Sciences; Eli Lilly and Company; LEO Pharma; Merck & Co, Inc.; Novartis; Novo Nordisk A/S; Ortho Dermatologics; Peplin, Inc.; Photocure ASA; Promius Pharma, LLC; Regeneron Pharmaceuticals, Inc.; Stiefel Laboratories; and Valeant Pharmaceuticals International, Inc.; and investigator honoraria from LEO Pharma and Pfizer, Inc. AAH has received investigator research funding from Dermira, Inc. (paid to the UTHealth McGovern Medical School, Houston); advisory board honoraria from Dermira, Inc.; research funding (all monies paid to the UTHealth McGovern Medical School) from Allergan, Plc., Amgen, Inc., Cassiopea, Celgene, Dermavant Sciences, Eli Lilly and Company, Galderma S.A., GSK, Plc., LEO Pharma, Mayne Pharma, Medimetriks Pharmaceuticals, Novan, Inc., Promius Pharma, LLC, and Vanda Pharmaceuticals; honoraria from Amgen, GSK, Plc., Pfizer, Inc., and Valeant Pharmaceutics International, Inc. JD and RG are employees of Dermira, Inc. JQ is a consultant for Dermira, Inc. and an employee of QST Consultations. DAG is a consultant and investigator for Dermira, Inc. and an investigator for Allergan, ATACAMA, Brickell, Galderma, Revance, and Sienna.